Home news WILL CRIME KINGPIN RADOVAN KREJCIR FINALLY BE SENT HOME TO FACE THE MUSIC? WILL CRIME KINGPIN RADOVAN KREJCIR FINALLY BE SENT HOME TO FACE THE MUSIC? For more than 10 years, the Czech Republic has been trying to extradite Radovan Krejcir. 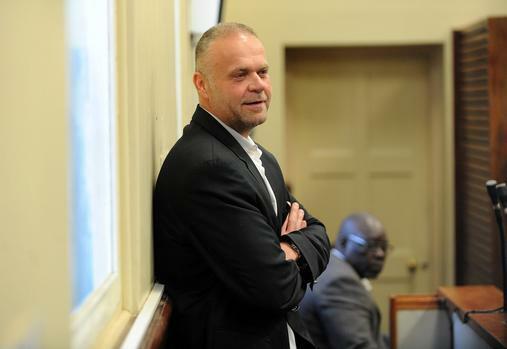 This week, the extradition proceedings finally began at the Kempton Park Magistrate’s Court court, with Krejcir admitting in open court that, depending on the outcome, he will enter a plea bargain with the State on two of his criminal cases. Krejcir is at the centre of a series of criminal charges - from the alleged murder of suspected Bedfordview drug kingpin Sam Issa to the conspiracy to kill forensic consultant Paul O’Sullivan and high-ranking police officer, Colonel Nkosana Ximba. He has also been accused of several attempts to escape from prison, with one of the incidents finally heading to trial in January. Despite the mass of criminal cases against him, thus far, he has only been convicted of drug dealing and attempted murder, for which he was sentenced to an effective 34 years behind bars. This week, his home country’s extradition proceedings began in earnest in Kempton Park, with specialist National Prosecuting Authority prosecutor, advocate JJ du Toit, presenting a timeline to the court of how the lengthy process began. When Krejcir first arrived in South Africa in 2007, the Czech Republic instituted its application in June that year. He was initially given bail of R1 million by the Kempton Park court, with the presiding magistrate arguing the extradition application had not presented a strong case. This despite several criminal cases opened against Krejcir in his home country. The office of the then-director of public prosecutions tried to ask for the magistrate’s recusal, but this was unsuccessful and the extradition case was discharged. However, a later review of this decision reinstated the application. After years of Krejcir’s attempting to slow the proceedings through the Supreme Court of Appeal, the case was finally placed back on the roll at Kempton Park in 2013. The proceedings were scuppered yet again after Krejcir revealed he had made a political asylum application with the local refugee board, and it was only after this failed that the case was reinstated last year. However, after several of Krejcir’s legal representatives withdrew after not being paid, the extradition hearing was only able to continue this week. Du Toit presented the Czech Republic’s application, which sought to extradite Krejcir to face four separate criminal cases - criminal conspiracy to commit fraud and murder, evasion of taxes, credit fraud and “committing an offence of deprivation of personal freedom and offence of blackmail”. In all of these cases, Krejcir was found guilty in his absence, though if he is extradited, he will be allowed to be re-tried under Czech law. While the case was postponed until January to allow Krejcir’s newest lawyer, Mannie Witz, to prepare his opposing arguments, Krejcir told the court this week that, depending on the outcome of the case, he was willing to form a plea bargain on two of his local criminal cases. These were the cases involving his attempted escape from prison and his conspiracy to kill O’Sullivan and Ximba. Regardless of the court’s ruling on whether Krejcir will be extradited, it will ultimately be up to Justice Minister Michael Masutha and his Czech counterpart to negotiate the terms of his return. Ultimately, he could be kept in South Africa to continue his prison sentence here.